Big Summer Competition Sweepstakes is open for worldwide. The Big Summer Competition Sweepstakes started from 21st June, 2018 and ends on 21st September, 2018 at 23:59 CET. 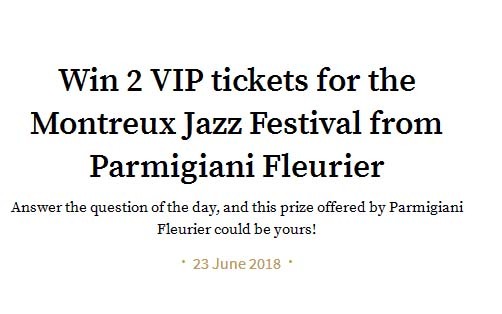 The winner of the Sweepstakes will be selected randomly from all eligible entries receive during the entry period and the Prize for the winner is 2 VIP tickets for the Montreux Jazz Festival from Parmigiani Fleurier. Prize (s): 2 VIP tickets for the Montreux Jazz Festival from Parmigiani Fleurier, waterproof bags, leather bags, cufflinks, footballs, tickets to the Switzerland-Belgium match in Novembre, books, bluetooth speakers, leather belts, notebook covers, tool kits, factory visits, bottles of wine and champagne.